This week, Umission honors Susan Barrett Merrill, Person of the Week, and is making a donation to the charity of her choice, The EarthLoom Foundation. 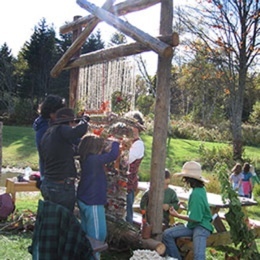 The EarthLoom Foundation is a hands-on experience in the art of creating community. An EarthLoom project’s goal is to weave together common values, (the vertical threads) with individual visions and differences, (the horizontal threads). The purpose is to discover joy, respect, honor, and peace. Working together with their hands, children and adults can create a new picture of how they relate to each other and the planet. Hats off to The EarthLoom Foundation for bonding hearts and promoting peace in neighborhoods.